I didn’t expect all the gift contained. Or how it would give back to me a hundred times over in the years that followed. I only saw a twenty-by-fifteen inch package, give or take, wrapped hastily in recycled wrapping paper. It was Mother’s Day 2006, when my boys were still young enough to bounce like Winnie-the-Pooh’s Tigger at the mention of their mom’s special day. Thus the reason for the gift. After opening it, however, I knew without a doubt that the gift came from someone other than my bouncing boys. I looked at my husband, stunned, thinking it to be some kind of mistake. I’d never had my own computer. We didn’t have the budget for this, at least not for a wife’s flimsy dream. He only smiled and nodded in return. For nearly nine years. Late at night. Early in the morning. At coffee shops, bookstores, my bedroom, my kitchen and my office. During carpool, while running errands. On the family room couch, in the backyard, while watching my children ride bikes in the front yard. On weekdays, weekends, holidays. In airplanes, on the ground. I wrote. And I wrote. And I wrote. In time, I lived a story. Then, when the time came, I told the story. Even better? When you purchase a copy of the book, you will get a FREE DOWNLOAD of a unique piece of art I commissioned specifically for this book. 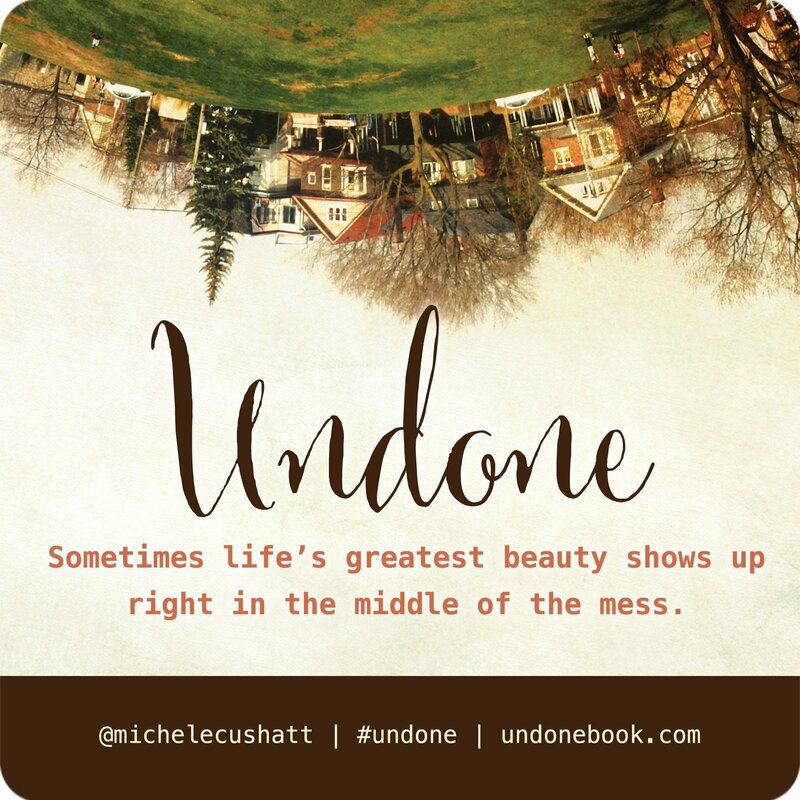 Created by the talented Mandy Thompson, it beautifully captures the unfolding of this undone, often unexpected life. 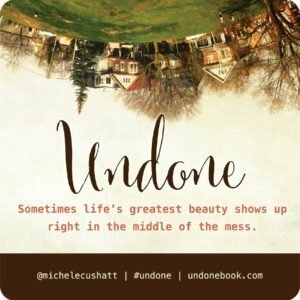 Go to UndoneBook.com to claim your free download. A wife’s dream. A husband’s heartfelt Mother’s Day gift. And years of living an unexpected life. I had no idea all that would transpire in the nine years since Mother’s Day 2006. No, I didn’t expect all the gift contained. The unexpected, unpredictable turns, both the good and bad. And although there are parts of this story I wouldn’t have written for myself, twists of plot I would’ve rather avoided, I can’t help but see the many ways the story has become something far more exquisite than my simple mind could’ve ever imagined. Congratulations Michele! I was privileged to get one of the early release copies, and I devoured it as fast as my job and toddler and messy house would allow. Your story is beautiful, and so are you. Thank you for sharing your heart and touching mine. This book is going to change lives. I know it’s changed mine. I can’t wait to go find your book-my life changed dramatically this past Nov 2014 when I was diagnosed with Stage 3C Ovarian Cancer-as a single parent (divorced) and with my wonderful boyfriend/significant other by my side every step of the way, we endured a intensive extensive surgery for me, 6 days in the hospital, and now going through month 4 of hopefully just 6 months of chemotherapy. You discover very quickly what things matter and all the ones that used to be on the list that are very unimportant. You discover strength of faith and prayer warriors like you have never known. Thank you for writing and sharing your own journey for the rest of the world to see. This bald woman warrior is fighting for her life and will be for the rest of my life-blessedly I got a clean CT scan after 3 months of chemo, so the plan is to finish up 3 more months and then hopefully remain in remission. My prayers are with you and your family-it is those whom we least expect to touch us when we need it the most. Michele – we have never met. It is on my bucket list to do so. I very much feel like I have come to know you through the words you write. You inspire me, as also on my bucket list and a goal I set for this year is to take major step in writing my own UNDONE story. Although I am not experiencing health concerns as you have done, we all have our UNDONE moments to ponder and look to Him in. Your story has echoed many things in my heart. I am grateful. I have about 5 weeks left in my own personal UNDONE season of being unemployed as I will be starting a new position requiring a move. Your story has been a MAJOR encouragement to me. I walked in the cold and prayed for you this morning. The Lord prompted me to fast one day per week for you and I will begin doing so this week. WAHOO!! Thrilled. So PROUD of you. Just…so. I have watched you labor and write and re-write and live and have times of not writing and then getting back into it again. Persistence. Dogged-determination. A lot of deleted words, paragraphs, pages to hone this beautiful story. A lot of making the choice to write when it was hard. But this–this gift you share back to the world. Well… *happy, happy, happy dance*! So thrilled for you my friend! Off to buy my copy now! You have no idea how much I needed this today. You spur me on to keep writing, keep believing even when it’s hard, even when it seems impossible. Thanks again Michele for sharing. Thank you for sharing this today Michele. You are such an encourager to us fellow writer’s that despair at times and want to give up. This was just what I needed today. Congratulations and well done, Michele! I really took to heart so much of your book. I have shared it with friends and more importantly family. When something impacts your life, you feel compelled to share it with all you care about. This is my selfish side. However when I read the comments and follow your blog, I am just totally blown away at how deeply you touched each of us. And so many of us! Bravo and praises to the work The Lord has done through you. I found it so difficult to put words to my own feelings and then found it echoed in your book. Now enjoy the rest you have so dearly earned. He’s got this! 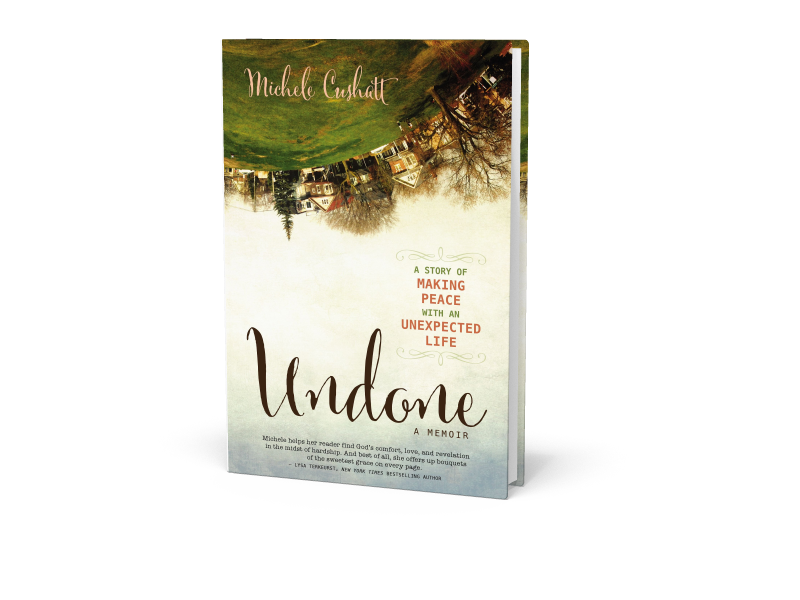 congratulations Michele! I can’t wait to read your story. I have been listening to Michael Hyatt podcasts and think I’m quickly becoming a big fan of YOURS…:) I love your voice and your way of communicating. So I know I’ll also love your story. Learning a lot from you and Michael as well, thank you. Just a note for Janice Brashier. You are my hero. :). I hope your world is wonderful, lovely and cheerful all the days of your life.